Their clinics are dusty spaces with limited electricity and no running water. Their operating tables are whatever desks available covered in garbage bags. Most of their clients have never seen a veterinarian before. Despite the odds, Canada’s Veterinarians Without Borders (VWB) complete their work on boundless ingenuity to save lives and reduce animal suffering. 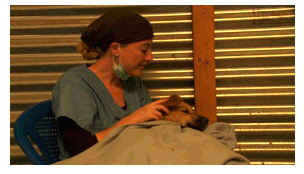 Their work is captured in the new webseries Vets Without Borders , launching on September 15th, Vets Without Borders follows a team of VWB volunteer vets and vet techs to Todos Santos, Guatemala. Todos Santos is a small mountain village where rabid dogs have attacked people, killing them with the disease. The vets are there to spay/neuter and vaccinate the dog population, but in a community with no other vet care there are many crises to overcome. From aiding a Rottweiler found dying in the street to a cardiac arrest during a spay surgery, the vets’ skills are pushed to the max in an environment where they have only the bare essentials. Webisodes #1 & #2 premiere on September 15th, followed by two new webisodes on the 22nd and the 29th.